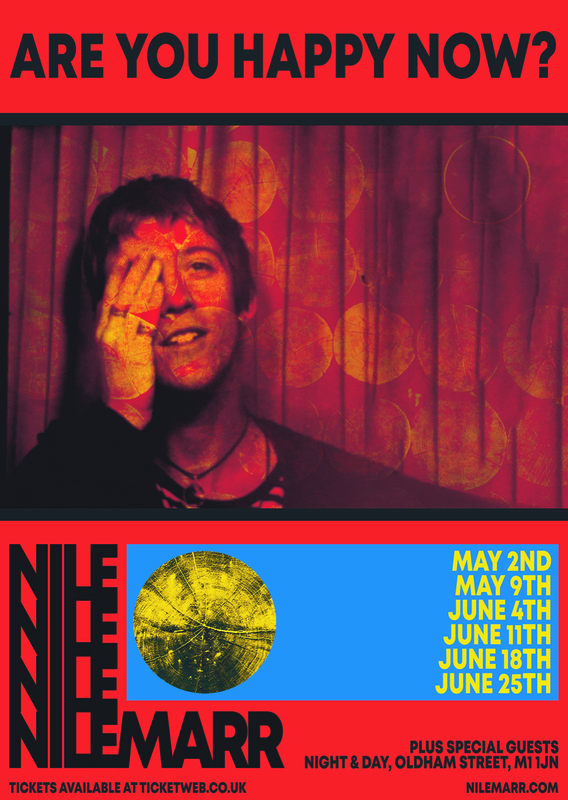 After touring the world with Hans Zimmer for over a year, NILE MARR has chosen to return to his Mancunian roots, announcing a six date series of shows at Night & Day in advance of his new album, ​“Are You Happy Now?”. 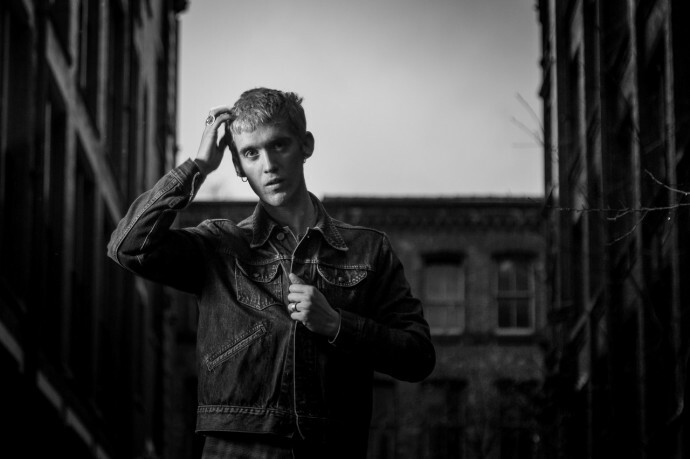 The 27-year old guitarist, singer and songwriter is Manchester born-and-bred, but has spent a number of years in Portland, Oregon. Growing up in these two epicentres of the global music scene, and spending his youth surrounded by great artists such as Modest Mouse, Talking Heads and Broken Social Scene has strongly influenced Nile’s life and art. His 2016 debut album ​“TV Broke My Brain”​ was released under the name Man Made and received widespread acclaim throughout the indie scene, on both sides of the Atlantic. Man Made spent several years on the road, earning themselves a reputation as a forceful live band. His sophomore effort, ​“Are You Happy Now?”​ is a collection of infectious melodies, characterised by Nile’s signature guitar tones and brilliant mastery of pop songwriting. As he puts it, ​“I didn’t want to make sad music… I wanted to express how moving back to Manchester felt. My music is there for people who want a bit of melody in their day; I want them to hear the music and dance around and feel good about themselves”​. The album was written in the space of 6 months, with Nile choosing to work in a room directly below a nightclub. ​“Creating something basically underneath a party was one of the most fun parts of making this record”​ he says. You can definitely feel that exuberance and positivity throughout ​“Are You Happy Now?”​. On Hans Zimmer’s World Tour, Nile was part of a production of epic proportions, sharing the stage with a 50-piece symphony orchestra every single night. So when it came to writing his own music, he sought to go back to basics. He took a no-frills approach, reducing his setup to a guitar and an amp in order to focus on the music. ​“I wanted this record to sound like the most organic version of us”​ he explains, ​“I spent a year being surrounded by unbelievably complex music and when I started working on my own stuff, I wanted to keep it as simple as possible”​. “Are You Happy Now?”​ was recorded during one 10 day session at Eve Studios in Stockport with engineer Jim Spencer (New Order, The Charlatans) and subsequently mixed by Claudius Mittendorfer (Weezer, Parquet Courts). During the recording process, Nile found himself constantly asking himself the same question: ​“am I happy now?”​. As he puts it: ​“The answer is yes”​, and he has every reason to be proud of his second album. From touring the UK club circuit with Man Made to playing massive arena shows around the world with Hans Zimmer, Nile Marr has garnered a wealth of live experience. Now he is now itching to take ​“Are You Happy Now?”​ on the road: ​“These days everything is set up for you to not leave your house, so if people have left the house to come and see you play you have to treasure that. You have to work for that. If you treat your audience with that level of respect, then I think you’re already setting yourself up for something good”​. As it happens, “something good” is a massive understatement when it comes to describing Nile Marr live. His respect for his audience clearly shines through, giving every show his all. truly feel this record is worth 40 minutes of someone’s time – it took 6 months of mine”​. 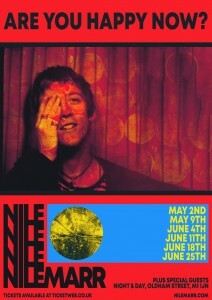 Anyone who takes the time to listen to ​“Are You Happy Now?”​ or visit one of Nile’s live shows, will not be disappointed.